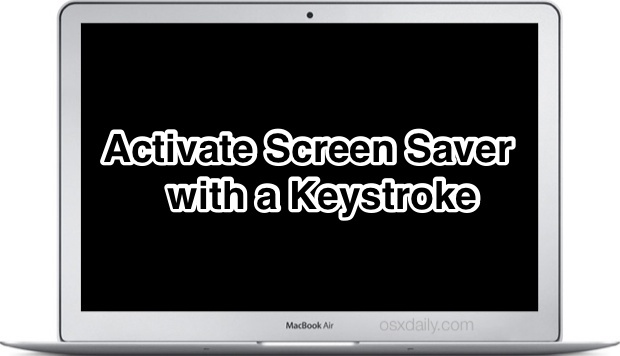 Have you ever wanted to initiate the screen saver of your Mac by hitting a keystroke combination? You’re not alone, and that’s what we’re going to show you how to do here. 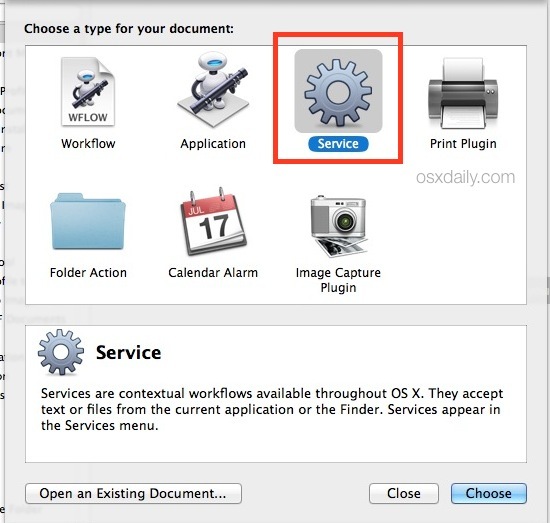 While Mac OS X does not include this feature by default, we’ll demonstrate how to create an Automator system service that will accomplish the same feat, activating the screen saver by a keyboard shortcut of your choosing. 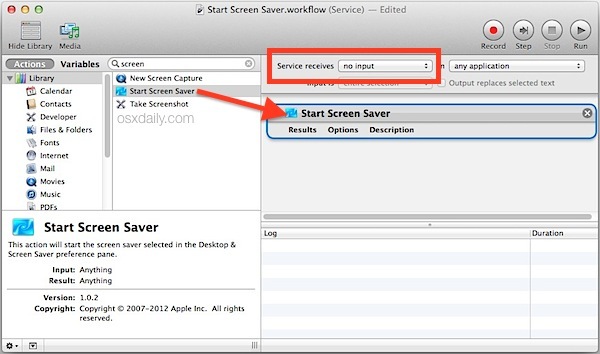 To be clear, this service will start the currently active screen saver, meaning whatever has been selected in the Desktop & Screen Saver preference panel, accessible from the  Apple menu and System Preferences. If you want to change the screen saver used by this, simply change it there in the system settings. For best results, use the screen saver with general password protection too, which will let the keystroke be used as a way to protect the Mac when you’re away from the keyboard or desk. Now that you have created a service that starts the default screen saver, you need to assign a keystroke combination to initiate the service. Be sure to pick a keyboard shortcut that is unique and easy to remember. You can try it out by hitting the set keyboard shortcut sequence, which will now initiate the screen saver immediately. To use this as a variation of the lock screen trick that doesn’t sleep the Mac display, be sure you have set a locked screen password and required the password be used to wake the Mac from a screen saver. That’s handled in the Security & Privacy preference panel under the “General” tab. Keep in mind you can always use hot corners to start the Mac screen saver too, which for some individuals may be faster and easier to remember than a keystroke, since you simply need to slide the cursor into one of the far screen edges to initiate a hot corner. But as long the ‘Finder’ is active, the keystroke doesn’t work for me. In any other program it works. Right, the screen sleep shortcuts already exist in OS X, but they simultaneously turn off the display. 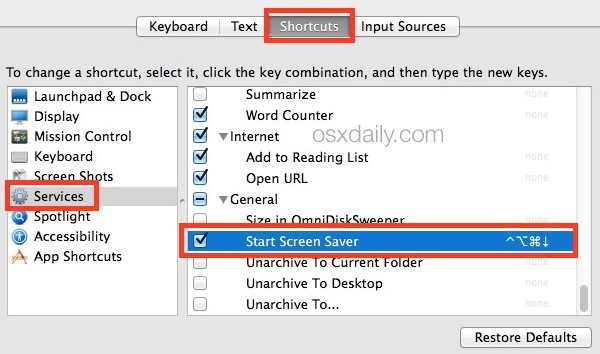 This shortcut launches the Mac screen saver without sleeping the screen, that’s the main difference. Thank you very much! Your comment helped more than the article! 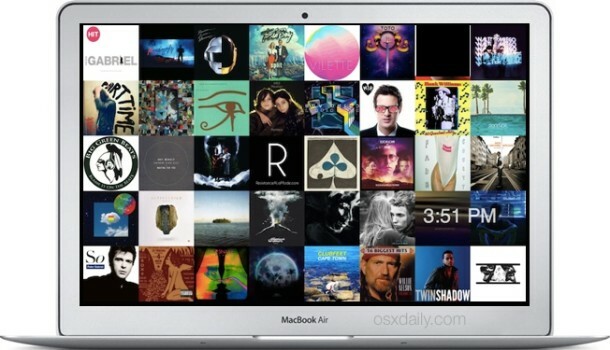 Or use the build-in lock screen shortcuts for Mac 10-6 up Inc. Mavericks. Alt + CMD + eject key. Pretty sure that puts it to sleep. Ctrl + Shift + Eject(or Power) puts your display to sleep. You likely just need to use a different keyboard shortcut, it may be conflicting with an existing system keystroke. Try something very unique that does not conflict with a standard keyboard shortcut, it will work to activate the screen saver. Or, you know, just assign it to a hot corner. hmm, can’t get this to work and i’ve tried about 8 different key commands now, up to 3 modifier keys and still no response. ‘start screen saver’ shows up in the Services -> General section, i try various shortcuts, it recognizes and inputs the shortcuts, but when i move to another app and test them there is no response, no screensaver. yes, the hot corners always work but i googled this function b/c i really need to assign it to a key command for something specific i’m doing, and need to get this working. also, if i go to the top OSX menu and select the current app name’s drop down menu, then go to the services menu, it shows up there there and i can select it with the mouse pointer, but the screen saver just won’t start. nevermind. just after posting i finally got it working. the action wasn’t saved in the right side panel :) you can delete my posts if you’d like. and thank you for sharing this – much appreciated. So I’m having a problem with this. I’ve tried it but the Service i guess won’t auto start? so i have to go into each app i want it to work in and go to services in the top bar and click it before it will work. also i have to do this overtime i restart my pc. so is there a way for me to get the services to “auto start”? This was very helpful. Perfect, easy to follow instructions and now my Mac starts the Aerial Apple TV screen saver on command. First, the screen sleep works. When I start my screen saver, either hot corners it comes on briefly and then quits, as if something else is wanting to wake it up. Any ideas? El Capitan 10.11.5 will be 6 soon. And the services screen saver I haven’t gotten to work yet, but still working on that. so when you’re doing absolutely nothing.. your screen automatically goes to the screen saver after 60 seconds.. Very good tips, thanks for sharing. Instead of making a service, I have made an app that sits on the desktop. I simply called up automator, selected App from the file new menu and then dragged the ScreenSaverEngine.app into the get specified finder items box. Save the app on the desktop and call it something appropriate. Click on the app and the screensaver should run. I have found that this needs to run for a few seconds to let it start properly or you end up with a blank screen. However, just type in your account password and you should be back in your account like normal.